When a car or home stereo goes bad, rather than throw it out, it’s worth the effort to take it apart at least a little bit and get at some of the potentially valuable scrap metal inside. In this post, we’ll give you some tips and tricks to make the process of dismantling a stereo easier. Metals such as copper and even gold (in small amounts) are often available inside stereos, and even the wiring and motherboards can have significant value. Before beginning to dismantle a stereo or any other appliance or electronic device, it’s important to make sure it is completely disconnected from all power sources. For a home stereo, unplug it from the wall, and cut the cord—this can be sold as insulated wire! Before dismantling a car stereo head unit, remove it from the dashboard. Stay safe, scrappers! Scrap copper is one of our customers’ favorite metals to hunt for, because it’s always in high demand. Even non-scrappers know that copper is a consistently valuable material. One of the most common ways to find copper is in the form of copper wire. One of the most common places to find copper wire is along with electronics. Whether you have some old computers you’re taking apart for their e-scrap value or a broken television set you’re having trouble getting rid of, it’s worth the time to do some basic dismantling to get valuable copper wire separated from other materials. The easiest place to find insulated copper wire is in power cords of electronics. Even if you don’t have many tools or much experience taking apart electronics, you can probably cut a power cord—just be sure to take all the proper safety precautions while doing so. A single power cord might not seem like it’ll bring a lot of value, but saving your insulated copper wire in a bucket or storage bin can lead to a pretty nice payday when it comes time to take all your scrap down to the yard. There’s a reason copper is one of the most frequently recycled metals at scrap facilities like Encore Recyclers. It’s pretty much the most valuable per-pound metal that you can frequently find in large quantities. However, it’s a lot easier to find if you know where to look—so here are the top five places to find scrap copper. This might be the best place to find scrap copper—but it’s also the one you most often hear about people stealing copper from. Whenever you see a pile of copper—even if it’s in a Dumpster—be sure to ask the owner’s permission to take it. It’s often best to get them to sign the copper over to you, too. One of the best ways to easily and legally get scrap copper from construction and demolition sites is to offer yourself up as a haul-away service. This is especially effective when it comes to small construction businesses, who may not have the resources to haul a lot of copper themselves. 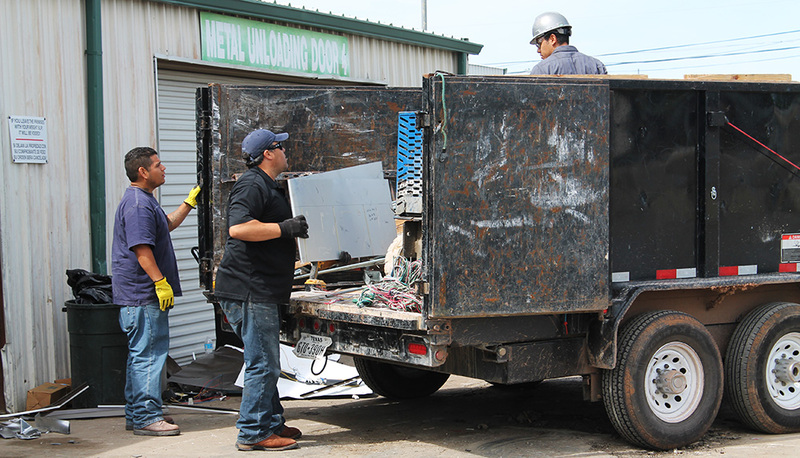 That’s where you come in—by offering to haul away their scrap for free or very cheap, you can help a small business while also making some money yourself. You can often get other kind of scrap metal, such as steel, the same way! Why Is Copper the Most Sought-After Metal for Recycling? If you’ve been scrapping in Dallas for a while, you likely already know that copper is in high demand—meaning that you get more money per pound for your copper recycling than for almost anything else when it comes time to bring your materials into the yard. Even if you aren’t yet a scrapper, you’ve likely heard at least one off-the-wall story about copper thieves stealing materials, especially copper wire. In two different cities, copper thieves actually succeeded in tearing out parts of underground power lines, leaving thousands of residents without power. Whether you’ve been scrapping for years or you just hear about copper prices, sales, or thefts now and again, you’ve likely wondered why copper is so valuable and sought-after. We have the answers—and tips on how to recycle copper easily and legally yourself! One of the biggest areas of contention in the scrap metal community involves the collection of copper pennies. Here’s some background on the subject to help you form your own opinions. But let us state clearly at the very beginning: scrapping or melting down a copper penny to be scrapped is currently illegal. As many scrap metal enthusiasts know, copper is a fairly valuable metal. Because of this, older pennies that contain copper are often considered to be worth more than their face value in scrap metal. Many estimate that each copper penny is worth about one and a half cents, though this fluctuates every day with the market value of copper. However, melting these pennies down is illegal, meaning that they are not viable for scrapping at this time. Despite this, many scrap metal and coin collecting enthusiasts collect copper pennies, hoping that the ban on melting them down will be lifted in the near future. Because of the significant enthusiasm around the collection of copper pennies, many collectors end up paying a premium on copper pennies. This is not worth the money in most cases for several reasons. The first is that copper pennies are readily available at face value. The second is that there is no guarantee that the ban on melting pennies down will ever be lifted. The third is that copper pennies are not pure copper; rather, they consist of 95% copper. While paying a premium for copper pennies is not a good idea, you may think it’s worth your time to get copper pennies in other ways. Simply picking up a roll or box of pennies at your local bank could net you a few copper pennies, for example, if you take the time to sort them. While there is no guaranteed return on this investment because the ban may never be lifted, you also cannot lose money “buying” pennies at face value. Some scrap and coin collectors don’t think sorting through the pennies is worth the time, while others think it is a fun hobby and a good way to find rarer pennies that fetch good sums of money on the open market.